ASOS sales grew 14 per cent in the quarter, but the company warned that there had been a significant deterioration in November and it was reducing its expectations for the financial year. UK retail sales were up 19 per cent to £231.7 million, while international retail sales were up 11 per cent to £402.9m for the three months to 30th November, it said in its trading statement. Total group revenue was up 14 per cent to £656m. Total orders placed rose 16 per cent year on year, but retail gross margin was down 160bps. Increased discounting, coupled with the unseasonably warm weather during the last three months has reduced average selling price which has not been compensated by higher units per basket. Consequently, average basket value is now lower year on year. “This has driven higher variable costs through both our distribution and warehouse cost lines. All other operating cost trends remain largely in line with expectations. 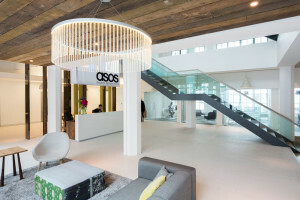 ASOS has cut its forecast for sales growth in the year to August 2019 to 15 per cent from 20-25 per cent. And it expects retail gross margin to fall by 150bps (previously flat at 49.9 per cent).